What is the purpose of the Docker Gloves? The Docker Gloves are heavy duty, industrial work gloves made from American cowhide with a cotton canvas lining. They offer complete cowhide covered fingers and reinforcement on the palm, back of the glove, index finger and thumb. 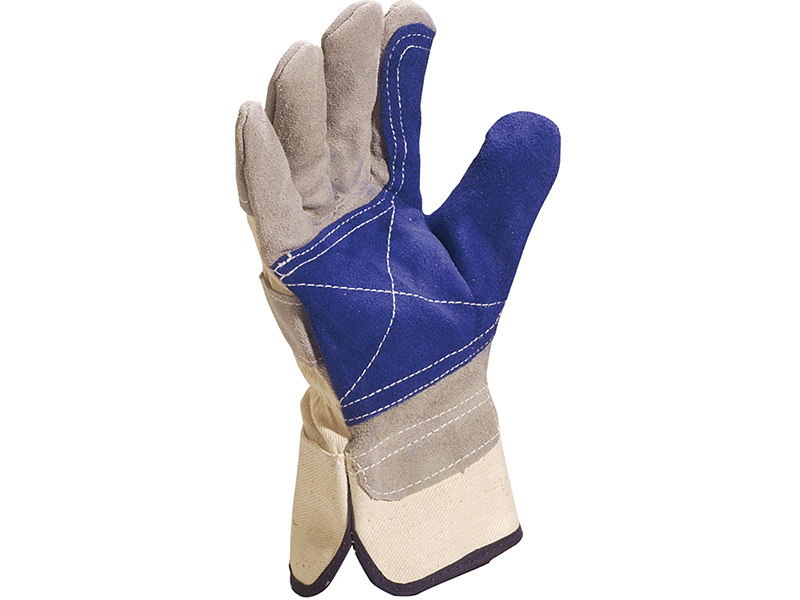 These gloves are ideal for use as personal protective equipment in industrial and general handling applications. Sold in packs of five, they are available in one size. The Docker Gloves can be used for a variety of tasks in industrial handling, delivery, unloading and warehouse working environments. They are also ideal for use as gardening gloves. The elasticated back offers ease of movement and comfort. The reinforced piping protects the seams around the thumb and palm. The Docker Gloves are ideal for industrial and warehouse workers, employees of the shipping and delivery industry, and gardeners. The white cotton cloth back and cuff with cloth lined palm and fingers provide superior comfort. These gloves have also been tested and confirmed to be abrasion, tear and perforation resistant. Keep your hands safely covered and enjoy the freedom of movement you depend on to get the job done. Our Docker Gloves come standard with a one year warranty. We also offer free delivery and easy returns. At The Workplace Depot, we offer a price promise. If you find the same unit on another site for less, we will match the price, guaranteed! The dexterity of these gloves are assessed and examined against harmonised European Standards and approved to EN420: 2003. The abrasion was also assessed and examined against harmonised European Standards and approved to EN388:2003.